Last year, Elsevier introduced its new Learning Trends Series with an article by André Nault, "Seven (serious) networking tips from The Machiavellian Librarian," and a free eBook, Marketing the Academic Library. Now, Elsevier has created Library Learning Trends, a professional development program for librarians that will be part of the larger Learning Trends Series. Tapping into Chandos Publishing, the Elsevier imprint covering library information science (LIS), and the knowledge and expertise of Elsevier’s authors, the program will offer librarians and information resource managers the latest views on a variety of topics and provide career development opportunities online and in-person. 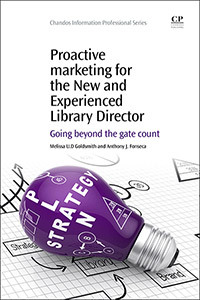 The excerpts below are from the Preface and Chapter 2 of a new book by Dr. Melissa Goldsmith and Dr. Tony Fonseca: Proactive Marketing for the New and Experienced Library Director: Going Beyond the Gate Count. At the end of this story, you can download Chapter 2. It is no secret that by nature academic librarians have been quiet and disengaged for too long in academia. New corporate attitudes towards academic librarians and librarianship overlook the obvious: that the quality of education at any parent institution relies upon having librarians who can support the institution’s mission as engaged academic faculty, not as cookie-cutter clerks. Cutting costs at all costs and corporate restructuring have victimized academic librarians, as if an anti-intellectual movement has risen from within US institutions of higher education. Marketing helps library directors to fight back. It strengthens the quiet and often oppressed voice of the academic library as it targets important listeners effectively. Proactive marketing involves not only marketing, but also anticipatory planning that reflects how the academic library is the heart of academe, now and in the future. Proactive marketing translates the day-to-day existence of the academic library into meaningful value for students, teaching faculty, administrators, and the parent institution’s community. 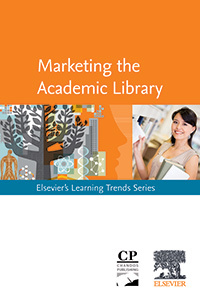 This book focuses on the concept of proactive marketing for academic libraries only. We use the term “proactive” to mean the kind of marketing that effects or initiates change in a manner that addresses issues with the academic library image. It entails identifying ongoing problems and, by anticipating how they may unfold, finding ways to minimize or eliminate them rather than waiting to run head on into them further down the metaphorical road. Rather than being reactive – to emerging events, issues, and problems – we call for directors to exercise thoughtfulness, an awareness of the big picture, a mindfulness of details, and sound reflection; we argue that it is ineffective to wait to respond only after something bad takes place. Being proactive has a big advantage over being reactive: since it involves acting early, it results in directors giving themselves time to plan carefully; being reactive puts that time at risk, often leading to hasty decision-making and inadequate short-term solutions. Successful marketing of the academic library uses methods associated with branding or image building, and should be seen as related to establishing eminence. Such methods include successful networking (physical as well as virtual), signature programming, memorable outreach events, mastery of teaching and learning theory and practice, and prominence as the gateway to institutional scholarship and research. Chapter 2, “The academic library as an educational system,” addresses the library’s powerful role as an educational system within its parent institution – a role that is almost always overlooked not only by those who do not work in the library, including teaching faculty and students, but also by academic librarians themselves. As an educational system within a parent institution, the academic library needs to find ways to evolve. This chapter suggests some possible approaches through proactive marketing that will enable library directors and their libraries to strengthen and articulate this role. Poet and literary scholar Kenneth Rexroth, while a student at the Art Institute of Chicago and afterwards, used the University of Chicago’s library to educate himself. New academic library directors must understand that as much as they have inherited a unit with a relationship to its parent institution, the academic library itself is an educational system or self-contained educational entity within its parent institution – a place where a student (or even a non-student) can become self-educated. This identity is critical to the academic library’s ability to pull itself out of the periphery and back into the academic and scholarly foreground of its parent institution. Currently administrators and academic library directors alike fail to recognize that the library is a unit much like other units on any campus, where teaching, learning, and life experiences occur, rather than a place where books (and their ideas) go to die. We have experience working in a library at an institution where an upper-level administrator announced at a faculty meeting that she questioned the need for the university to have a library in the near future. 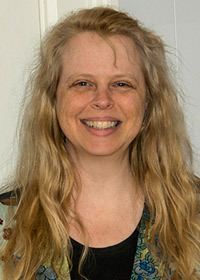 A person who often cited blogs rather than scholarship in presentations to faculty, she based her information on news about a public library that disposed of its entire physical collection and became an all-electronic entity, failing to realize critical differences in mission between academic and public libraries. The further reality was that she came from a corporate background (a family in the banking industry) and was eyeing library space as a means of creating museum-like displays for local businesses. For the new director thrown into such a situation, motivations become irrelevant since the political reality is an administrator whose short-term thinking for the library runs antithetical to what any good academic library needs to do in its long-term planning. As mentioned, one of the most powerful cards the academic library holds, no matter the situation, is that it is an educational system. This facet of the library’s identity is too often either forgotten or disregarded. With the exception of small parent institutions with small faculty-to-student ratios in outstanding units, the academic library has the greatest potential of all campus entities to become the learner-centered environment for students. Here students – whether studying resources, getting hands-on experience with materials, or working on a paper – can best control learning style, timing, quality, and quantity, as well as depth and breadth; the academic librarian as multidisciplinary scholar/expert adds yet another level. Most agree that the college experience is assessed by student learning, based on an understanding of what they need (and what they do not). The academic library is a ripe training ground for learning to prioritize. For some library users, the grade-free and user-friendly environment, as well as librarians’ and staff members’ general willingness to help, cultivates intellectual curiosity and thirst for knowledge. In the best situations, academic librarians work frequently with students and faculty, building rapport, mutual respect, and an eventual understanding of the depths and limits of knowledge and ability. These librarians are in the position to coach users for success in their research, to share enthusiasm for studies or college in general, and to contribute to lifelong learning and transformative knowledge. The academic library as an educational system can be a learner-centered environment that exercises learner-centered practices (LCPs). And, fortunately, these practices – as well as the phrase “learner centered” – are used often in institutional mission statements. 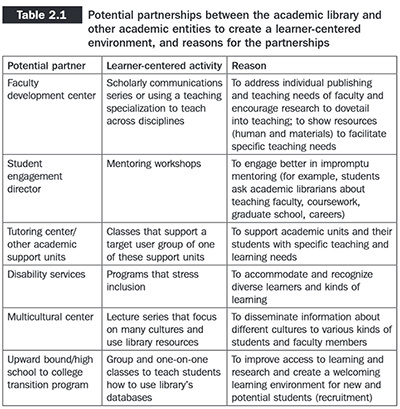 Table 2.1 shows just a few examples of partnerships that can be formed between the academic library and others on campus in order to promote a learner-centered environment. Read or download Chapter 2: "The academic library as an educational system"
This chapter is also on ScienceDirect along with the rest of the book. Dr. Melissa U.D. Goldsmith is co-owner and sound recording engineer and producer for MLMC Media in Northampton, Massachusetts. Previously, she was visiting head of Digital Special Collections and Technical Services at Elms College in Chicopee, Massachusetts. She has an MLIS, a certificate in advanced studies in library and information science, a master of liberal arts degree, and a PhD in musicology from Louisiana State University, as well as an MA in music history and theory from Smith College in Northampton, Massachusetts. Dr. Goldsmith has been a director and grant administrator of a music learning center in the library, head of multimedia, and reference librarian/associate professor as well as an instructor for music courses. Since 2007 she has been reviews editor for The Journal of Film Music. Her articles on librarianship, popular music and film music have appeared in Choice, portal, Notes: The Quarterly Journal of the Music Library Association, Codex: The Journal of the Louisiana Chapter of the ACRL, Louisiana Libraries, and Naturlaut: Journal of the Chicago Mahlerites. Her book chapters have appeared in Dracula’s Daughters: The Female Vampire on Film and Crossing Traditions: American Popular Music in Local and Global Contexts. 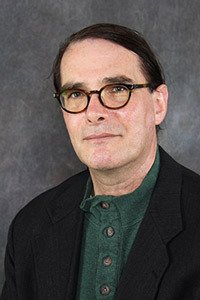 As a member of the American Musicological Society, Goldsmith has chaired sessions on electronic theses and dissertations, alternative careers in musicology (including music and special librarianship), student leadership, and music librarianship, served as listserv moderator and member of Communications, Career-Related Issues, and Outreach, and presented papers on Alban Berg’s film music interlude in his opera Lulu, Jim Morrison’s rapport with the underground newspaper The Los Angeles Free Press, William S. Burroughs’s musicality, and Kenneth Rexroth’s jazz poetry experiments. Dr. Anthony J. “Tony” Fonseca is Library Director at Elms College. He has an MLIS from Louisiana State University and a PhD in English from the University of Louisiana-Lafayette. He has worn many hats in libraries, including systems administrator, information literacy coordinator, reference librarian, and head of serials. Dr. Fonseca has published articles on librarianship, horror literature, and popular culture studies in Aickman Studies, Technical Services Quarterly, Codex: The Journal of the Louisiana Chapter of the ACRL, portal, Collaborative Librarianship, Dissections, and Louisiana Libraries. He has also had chapters published in Dracula’s Daughters: The Female Vampire on Film, Ramsey Campbell: Critical Essays on the Modern Master of Horror, Informed Transitions: Libraries Supporting the High School to College Transition, Crossing Traditions: American Popular Music in Local and Global Contexts, and Icons of Horror and the Supernatural: An Encyclopedia of Our Worst Nightmares. He is also co-author of the Hooked on Horror genreflecting series, as well as Read On … Horror. His upcoming co-authored book with ABC-CLIO is titled Encyclopedia of the Zombie: The Walking Dead in Popular Culture and Myth. At present, he is working on a co-authored book on Richard Matheson for Scarecrow Press.